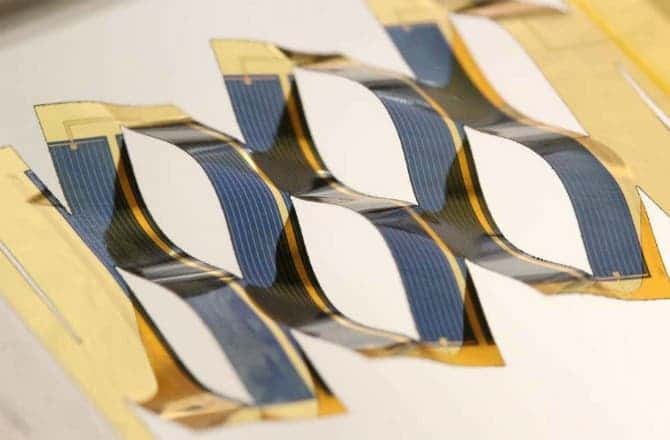 An innovative ‘kirigami’ design allows solar cells to flex and twist to follow the sun throughout the day. This means 20 to 40 percent more energy per year generate than cells stacked in fixed panels you see on rooftops. The design is based on origami, with the addition of cutting besides from folding. Tracking arrays for solar panels aren’t new. They’ve been used for decades and typically consist of a frame actuated by motors that tilt the axis of the panel in conjunction with the sun’s path from east to west. However, the additional system is expensive, takes up a lot of space and is often unpractical as far as rooftop solar panels are concerned. These makeup 80% of all installation. University of Michigan engineers have thought of a solution. Instead of mounting the solar panels on top of a revolving axis, they’ve found a way to twist and turn the PV cells inside the solar panel directly. The prototype consists of flexible solar cells made of gallium arsenide which were cut in a precise pattern. When both ends are pulled at the same time, the structure morphs and attains a desired slope. Crucially, each flexible patch tilts in a way that doesn’t cast a shadow on the adjacent cell. The “waviness” doesn’t affect the performance of the cell in any way, either. Though it’s just a prototype and the researchers need to solve some challenges, like how to stack cells, protect them from the environment and include a reliable motor, the proof of concept is definitely impressive. It could up efficiency by at least 20% and multiplied with hundreds of millions of solar panels, this would amount to a lot of extra energy into the mix.